Although best known for works of science fiction like Journey to the Center of the Earth and Twenty Thousand Leagues Under the Sea, Jules Verne has dipped his toes into the world of horror too. 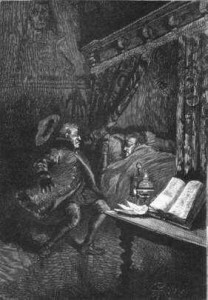 “Frritt-Flacc” (whose title is apparently onomatopoeia for the sounds of a violent storm) is the story of a greedy physician getting his comeuppance in a most unusual way. Ah, creepypasta. It’s the horror fiction version of “copypasta” that’s given the world classics like Jeff the Killer, Smile Dog and the infamous Slender Man. But there’s so much more to it than those three. Check out this massive collection of creepypasta if you don’t believe me. If you aren’t sure where to begin, be sure to check out these helpful suggestions. That said, several of those stories feature content that isn’t appropriate for all ages. Speaking of stories requiring content warnings, check out “The Sloan Men” by David Nickle and the Google Books preview of 100 Jolts: Shockingly Short Stories by Michael A. Arnzen. If you love Lovecraft, you’ll definitely want to check out “The Plain of Sound” and “The Stone on the Island” by Ramsey Campbell, along with “The Doom of Yakthoob” by Lin Carter. You might also enjoy “Will” by Graham Masterton and “The Thing on the Roof” by Robert E. Howard. You might recognize those last two authors as the creators of The Manitou and Conan the Barbarian respectively. As a special treat, here’s the rarest and most obscure Lovecraftian tale of them all: “Waters From Meron” by James Lankashire. As you’ve no doubt surmised from that link, “James Lankashire” is just the old pen name of Zombos’ Closet of Horrors creator JM Cozzoli. Just keep in mind that this was the first story he ever wrote at the tender age of 19. Hopefully if sales of his upcoming nonfiction ebook are good enough, he might be tempted to take another crack at writing horror stories. I do realize that Lovecraft-based stories aren’t everyone’s cup of tea. Those preferring more traditional scary stories should visit Chilling Tales For Dark Nights. Such parties might also want to check out the literary works of Pumpkinrot. That’s right, he also writes ghost stories in addition to creating amazing decorations and short films. “8:18” is one of my favorite Pumpkinrot stories and I find it quite refreshing to read a “ghost story” that is actually a scary story about a ghost. In my last collection of scary stories, I touched on the subject of invisible monsters and somehow forgot to include Fitz-James O’Brien’s “What Was It?” Which is odd, given how the ending so memorably differs from other tales of its type. Things aren’t always what they appear to be. That’s a major part of “The Tree Is My Hat” by Gene Wolfe. The title might sound funny, but what happens in the story sure isn’t. Deceptive appearances are also a part of “Growing Things” by T.E.D Klein. Those who don’t read it closely enough might mistake this for slice of life story about a man reading old magazines, rather than see it for what it really is. You’re going to want to fire up your PDF reader for the final two stories of this article. John Kessel’s Pride and Prometheus is a literary mashup of Frankenstein and Pride and Prejudice, while “Losing My Skin” is a story from the creator of the Garage of Terror home haunt that is (loosely) based on true events!